"The Cursed" is a very unique free realtime-strategy game based on the Spring engine. The game is about bones, undead, demons, space marines and magic settled in a futuristic environment. It is a fresh mixture of gameplay elements from many popular RTS games, like Starcraft or the C&C series. The game features two unique races: The Cursed - a faction combining undead and demonic creatures and the Imperial Guards - human forces with high-tech weapons and incredible firepower. Many units in game have unique abilities, like burrowing, rocket jumping, teleporting, transmutation and aura casting. You will experience a war that is fought with tanks, guns, space crafts, bone dragons, priest, demons, werewolf and angels. 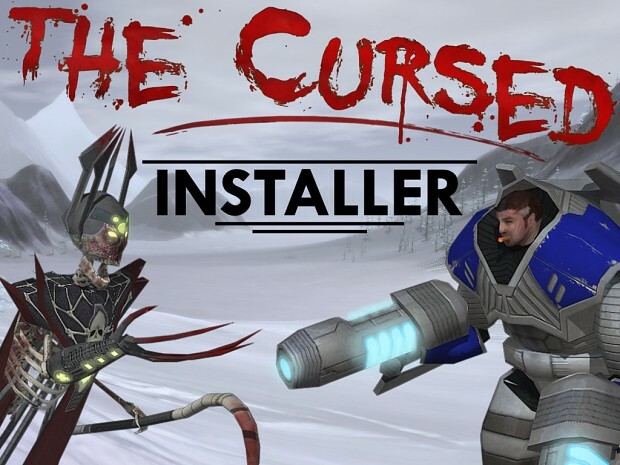 This is the full installer for The Cursed. It includes latest version of the game (1.402) and a Spring engine version 100. With the new installer a number of additional maps is included as well as a quick start menu that allows you to jump right into action. Compared to version 1.400, a hotfix is included that fixes crashes after exiting the game - this did not ruin the matches, but was pretty annoying. Moreover the game did waste 1.2Gb of disk space for an unnecessary configuration file. Please completely uninstall the game (1.400) and delete all folders before a reinstallation. airborne units do not land anymore. This should make handing especially of interceptors much easier now. There are tons of other tweaks and changes. Find them in the Changelog. Looks interesting.Is there a god mode,please?I'm a very crappy player.Thanks in advance! When will there be a Linux version available?